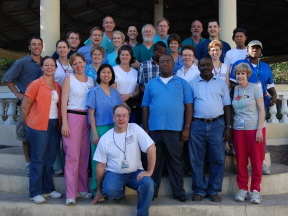 Since 1999, parishioners from the Catholic Churches of St. Benedict (Duluth, GA) and St. Monica (Suwanee, GA) have been traveling to Hinche, Haiti to provide medical and financial assistance to the poor and underserved of this area. In concert with Father Jean-Navarre Bourdeau, the pastor of Sacre Coeur Church in Hinche, the parish families of St. Benedict and St. Monica annually send a team of physicians, nurses and other staff to attend to the healthcare needs of this community. As Medical Director and annual physician participant, I have been very fortunate to witness the tremendous help this trip has been to our Haitian friends. Allow me to give you a brief history of this mission. Our first trip in 1999 was a real eye opener. The level of poverty and sickness that greeted us on our arrival was virtually overwhelming. At the time, St. Benedict’s had been funding Fr. Bourdeau for about two years through the Catholic Church’s Parish Twinning Program to help him build his own church. Our first mission was held inside this partially built church…no windows or doors, no pews, just four walls and a roof. All our medicines and supplies were in boxes in one corner of the church. There were two other physicians with me, a dentist, and a handful of nurses. There was no reliable electricity and scarce running water. We gave out vaccinations, treated hundreds of people suffering from infections, scabies, malaria, hypertension, malnutrition…all the typical illnesses you would expect to see associated with trying to survive in a third world country with limited resources and very poor infrastructure. That trip was unforgettable for many reasons; the shocking realism of observing such profound poverty firsthand and for the first time, attempting to provide quality medical care under such austere conditions, and that I had the privilege of delivering a healthy baby boy with the able assistance of our medical staff. That first trip served as the launching pad for future missions. Since then, Sacre Coeur has grown and evolved. Through the interest and generosity of individuals like you, Father Bourdeau has completed his church and rectory. He’s constructed a parish hall for community gatherings and a dormitory for housing of patients from far off villages who come to be seen at our clinic. 2003 marked the opening of our permanent clinic site, the Whitney Clinic, named after the orthodontist whose generous donation allowed us to fund its construction. The Saint Monica Refectory has been completed as well and serves as a soup kitchen for the starving families in this community. Our Mission trip has evolved as well. From just a handful of medical staff, we now send over thirty people each year, 5-6 physicians, 2 dentists, a pharmacy staff and a cadre of nurses and non-medical support staff. In addition to medical care, we now provide support in the form of donated food and clothing. We have the capability to perform minor surgeries, provide excellent tertiary medical care, and can evacuate urgently ill patients to other hospitals in Haiti for more skilled care if the need arises. In 2002, we attended to a young man who suffered a broken spine while he was collecting water in a ravine for his family. Our unit, working as a team, cared for this man overnight in our clinic with the proficiency and excellence that would rival any ER in this country. The following day he was flown to a charity hospital in Pignon, Haiti where he was able to receive orthopedic surgery to repair his injury. During a return trip in 2003, we saw him again in our clinic. He came back to thank us for our efforts in helping him with his injury. I was moved to tears when I saw him walk into the clinic with his family. My first impression was shock at the realization of how tall he was. This 15 year old’s height never registered with me last year because he came into our clinic on a homemade cot, in excruciating pain, unable to move his legs. From there, he was transferred to a makeshift backboard where he lay all night until we could charter a plane to transfer him the following day. And now there he was, standing in front of me, nearly as tall as me. To see him standing upright…not confined to a bed or a wheelchair…was my moment of realization. My eyes were opened. For every story like this one, I can tell you many more. In our absence, the Whitney Clinic is continuously open, run by local Haitian physicians from a nearby hospital, equipped with medicines and supplies provided by the support of our two parishes and concerned individuals like yourself. But the only way we can continue to provide this good work is through the help of individuals who also want to make a difference in this world…to ease the pain and suffering of people who are less fortunate. Our mission trip is only a vehicle. Without the interest or donations of concerned individuals, we would certainly not have the resources to continue what we’ve started, and not at the level of care which we currently provide. If you feel like this trip is a worthwhile endeavor and would like to contribute in some fashion, financially, or with time or talent, then I welcome your generosity. Please feel free to contact any member of our team if you have any further questions. 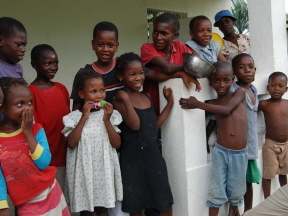 Again, thank you for your interest in our work in Haiti. Please donate your time, treasure or prayer, and make a difference. 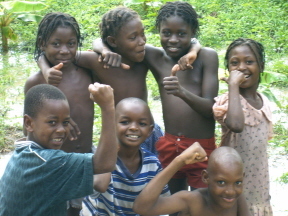 Your tax-deductible gift helps us save lives and carry out life-changing programs in Hinche. Please send any questions or comments to us - we will be back in touch as soon as possible.